T4 Desktop is a professional front-end software trading platform that offers the professional trader the ability to trade with ease, satisfaction, and total flexibility. 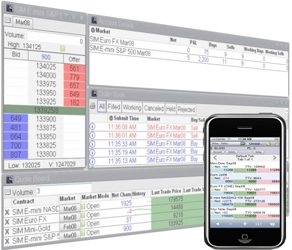 T4 Desktop was designed to include rich, easy to use front-end functionality, along with maximum speed, customization capabilities, and a back-end that offers the trader extreme reliability. With T4 Desktop, you can trade from anywhere. Whether you are at home, in your office, or on the road, when you trade with T4 Desktop, all you need is access to the internet and a computer and you are ready to trade. T4 Desktop can be hard-wired to your firm's network or can easily be used at home via your home internet connection. Create your own customized functionality or your own black box system using T4's available open API.